After the considerable morale boost of actually winning a game, I was ready for the last round. Having played the other top 5 teams so far, we had a final challenging opponent team to face: the second Belgian delegation, featuring the crème de la creme of the Tour D’Ebene gaming club (the biggest gaming club in Belgium, to my knowledge). Francois had sworn off the booze for this last game, so he managed to get pretty good pairings for us : Our vermin swarm against Empire of Sonnstahl, our Vampire Covenant against Vermin Swarm, the Daemons against Dwarven Holds and, finally, myself against Vampire Covenant. Edouard, the Vampire player, is an experienced VC general. Back in early 9th age, we had faced each other in a tournament, where we ended up with a draw after I played like a muppet and wouldn’t engage his big units nor the varkolaks. Mind you, I was running a Shapeshifter and a Wild Huntsman Prince, so I really don’t know what I was thinking... Bottom line, he knows his stuff and had given me a serious headache last time we played. An interesting approach, with four fast hard hitters, a couple of anvils and a healthy amount of magic to keep all that alive. The game is now quite hazy (it has been a month!) so I’ll be brief and let the photos do the talking. Our scenario was Hold the Centre and the deployment was counterthrust. Against vampires the Centre scenario is not ideal, but my strategy was to move the trees aggressively towards the enemy, pin the scorers down away from the objective while my fast units and the shooting deal with the flankers. The counterthrust deployment helped a lot: I got the first drop, and secured the 18” central deployment. The final deployment saw the vampires pushed into their deployment zone (12”) and a couple of march moves away from the central objective. As a plus, the amount of redirectors Edouard had brought meant that I also managed to secure the first turn with a +3 advantage. For spells, I got Throne, Regrowth and Master of Stone, while my opponent got the entire Evocation path more or less. With the first turn secure, I had been quite aggressive in my vanguards and scouting. The kestrels moved up to threaten the enemy mage bunker (while it was still small) and the redirectors. 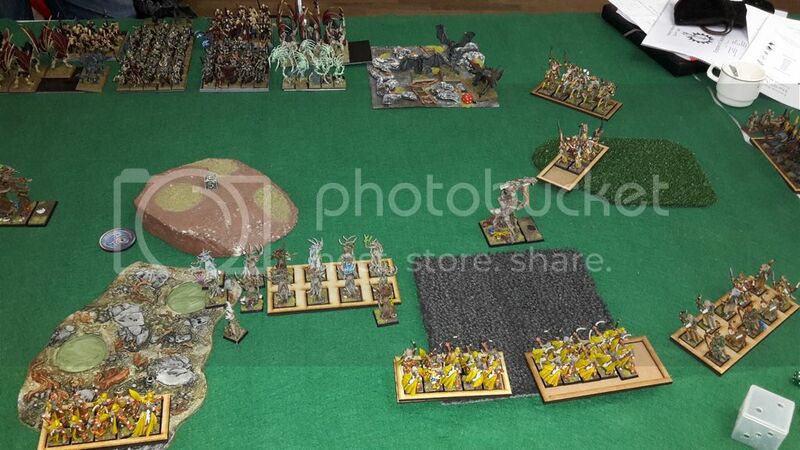 In the middle, the treefather advanced to hinder the approach of the undead infanty, while to the right the Wild Huntsmen, Bladedancers and Treefather set a trap for the varkolak, while making sure that he wouldn’t be able to rush past them and behind my lines. Magic started with a dispelled Throne, which allowed me to hit the Wraiths with the master of stone; one wraith died to the magic missile. Shooting was more effective: the left treefather and a unit of Sylvan archers killed a Vampire Spawn, while the other two archer units, the Treefather to the right and the pathfinders dealt two wounds to the varkolak. After much deliberation, my opponent took the bladedancer bait: it is true that they were too far away from the BSB, so I’d be only getting one steadfast Ld test. The Vampire spawn to the right also went in, hoping to whittle down the bladedancers fast enough. The middle of the vampire army advanced in a coherent manner, with the second unit of vampire spawn performing a flanking maneuver to my left. In the magic phase the ring of fire killed five dryads, and then I failed to dispel the Whispers of the Veil on the Blaedancers in combat. A wraith also rose from the grave. In combat, the dancers went for the 3+ ward save, and they did manage some wounds on the Vampire Spawn. They lost 3 of their number to the enemy attacks, but held their ground on a Ld8 steadfast! The Treefather to the right and the Wild Huntsmen fell on both flanks of the bladedancer combat, while the middle Treefather charged the Barrow Guard, to keep them from advancing on top of the objective. The kestrels maneuvered some more, as did the shooting part of the army. The dryads moved up to be in range for some toxic spore shooting. Magic was uneventful, but shooting killed yet another Vampire Spawn to the left, and four wraiths from the big unit to the right. In combat the charging wild huntsmen and Treefather predictably made short work of the Vampire spawn and the Varkolak. In the treefather/barrow combat, the barrow guard failed to wound the tree, and got just a couple of wounds back. The treefather lost combat, but held thanks to the nearby BSB. With the wraiths not in a position to flank the Treefather, my opponent opted for a second turn of maneuvering. The Wraiths moved through the dryads, killing another four. 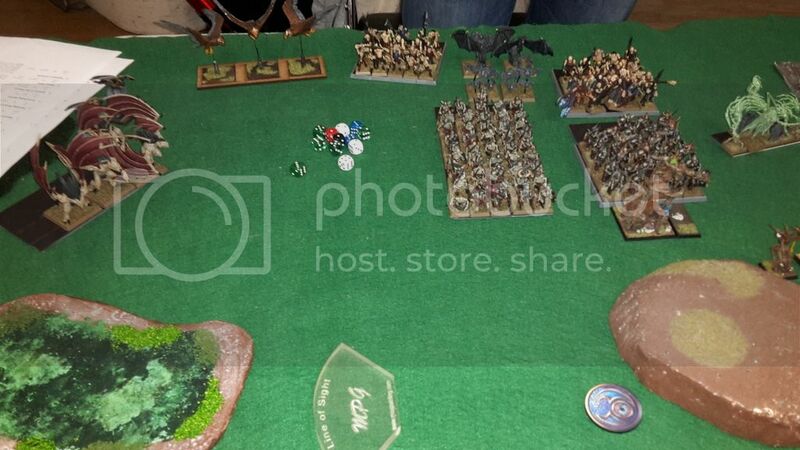 The bats moved into position to block the charges of the dryads and the bladedancers on the following turn. In the magic phase I managed to stop two evocations, before the third one raised the barrow guard back to full strength. 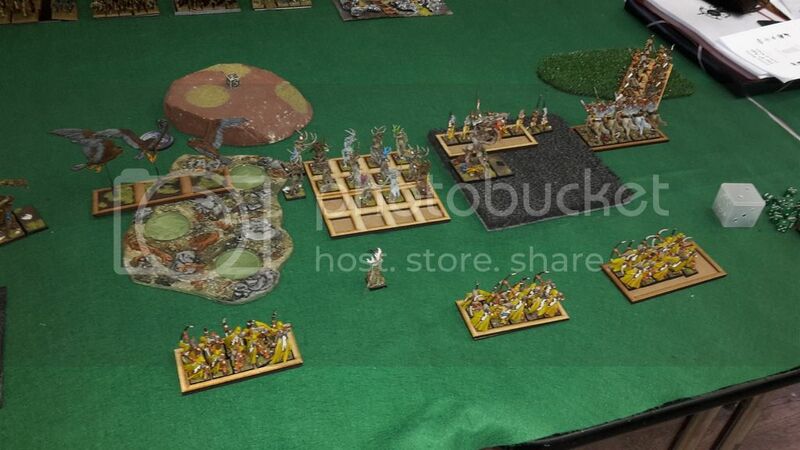 The dead arise was also cast, creating a new unit of zombies to stop me from flanking the barrow guard. The Wraiths were also healed to 8-strong. In combat the Treefather suffered a wound and stomped 4 barrow guard back, holding his ground once more. The Kestrels spotted the flank of the (now 4-strong) vampire spawn, and with a quick calculation I figured I had a good chance at killing them outright. So in they went. The dryads took the bat bait, as did the rightmost bladedancers. The treefather moved up to threaten the wraiths. Magic went spectacularly well, with the throne getting cast, then the Edouard failing to dispel the Summer growth on the right dancers. They came back at full strength, and the treefather in combat recovered his lost wound. Shooting was focused on the wraiths, and killed 5 of them. The treefather/barrow guard fight continued, the tree now killing 6 barrow guard for no wounds back. The dancers made short work of the bats and overran into the newly created zombie unit. The Kestrels fluffed their attacks, only killing a couple of Vampire spawn after combat resolution. They were now sitting ducks! The zombies rear-charged the Kestrels, while the Wraiths rear charged the Treefather. 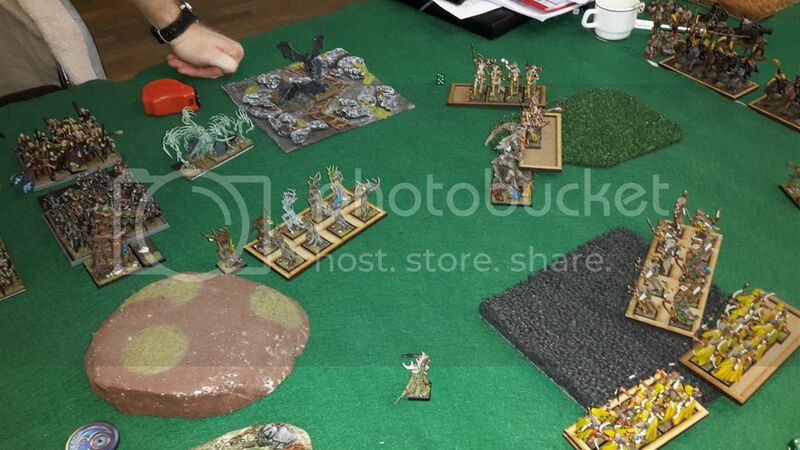 A second unit of giant bats redirected the Wild Huntsmen now , while the skeletons slowly shuffled towards the objective (and one of my sylvan archer units). Magic saw a couple of wraiths come back with an invocation, the rest of the magic getting dispelled. In combat, the Treefather dodged most of the Wraith attacks, and proceeded to stomp them to the ground. The big tree got two wounds for his troubles, but he held his ground. The Bladedancers made short work of the zombies, and reformed to flank charge the barrow guard on the following turn. 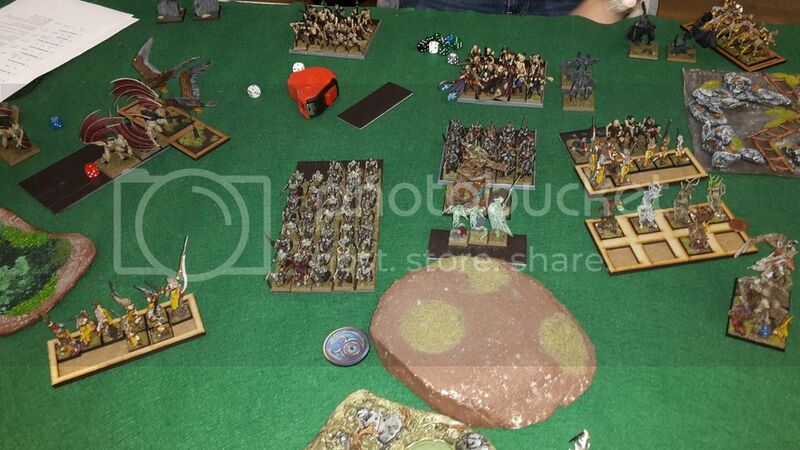 The kestrels got beaten down by the rear charging zombies, and got ran down by the single surviving vampire spawn. No more pictures from now on. My fourth turn proved to be decisive: the right unit of bladedancers flanked the barrow guard, along with theunengaged treefather. The dryads made way for the big tree by charging some nearby bats, while the wild huntsmen, lacking a better target, took the giant bat bait. To the left, the bladedancers charged the last surviving vampire spawn. In the magic phase I healed the treefather back to full wounds, and in combat the combined efforts of two treefathers and a full-size unit of bladedancers managed to pop both the wraiths and the barrow guard! 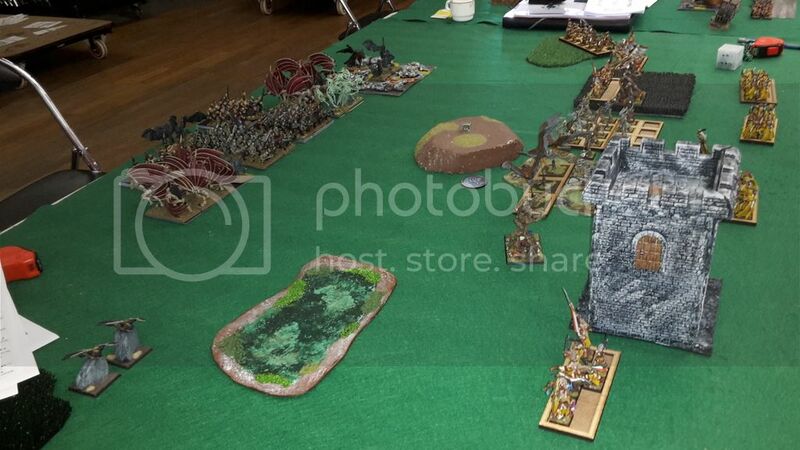 With no chaff left, and only the skeletons and two zombie bunkers left, my opponent went into point conservation mode: the vampire general along with zombie bunker headed for the hills, while the two necromancers were used as redirectors eventually. By turn 6, the Skeleton unit was surrounded and I had 3 units on top of the objective. A last turn combined charge on the skeletons (by now around 50-strong) managed to kill 45 of them, awarding me half points for the unit and ending the battle. 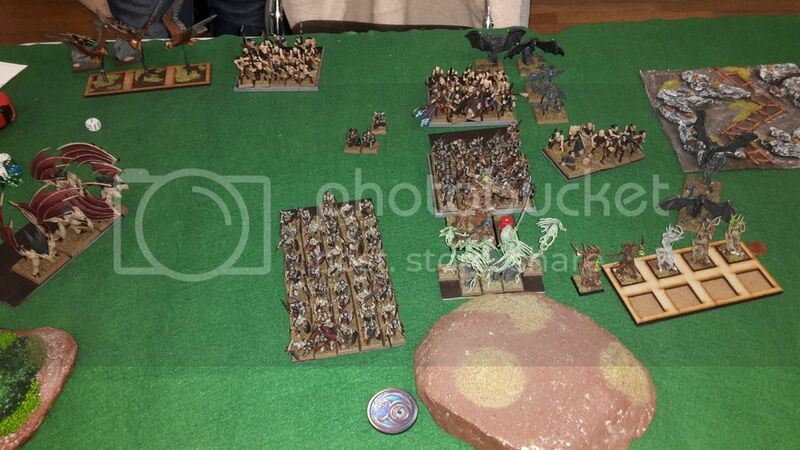 In the end, I had lost only a few points, meaning that the game ended a 20-0 victory for the Sylvan Elves. I think that this game was decided by two things: the deployment that allowed me to keep the vampire forces away from the objective, and the fact that I was able to draw out the hard hitters early on and swarm them. The treefather was lucky that my opponent couldn’t roll any 6’s, meaning that every turn he got a single wound at most, which I was able to regenerate with Druidism magic. The more I play against, vampires, the more I think that they are a good matchup for Sylvan Elves: the damage output of our combat units means that with some careful planning we can kill even the biggest units in a single turn, avoiding the Evocation shenanigans. This time, the absence of a fighter vampire made things even easier: usually, there is a single unit that I have to avoid, the one with the killer vampire inside. Without such a combat character to anchor the list, the T6 treefathers can wreak havoc. As for my team mates, they also did great in their matches: we won the round by a healthy margin, winning 3 out of 4 games. When the time came for the prize ceremony, we were happily surprised to hear our team named as the winner of the event! Turns out that the fact that we never lost a round by a huge margin, and also that we won two big wins gave us the advantage. The bonus points (for sportsmanship, but also for painted armies and sending correct army lists on time ) helped push us over the Paris team that we lost to on round 3. We got a good laugh out of it, since we weren’t expecting it! Overall, the tournament was a good experience with challenging and (mostly) fun games. It took me a while to get used to the list and its potential, and it was only in the last two games that I felt confident enough to push the trees forward early on. That’s what you get when you don’t get any practice games in! In the end, I got 58/100 points, a positive result for the team even with 3 arguably bad pairings. This happens from time to time, since captains feel safer throwing under the bus an army that can conserve points in a bad matchup. In both of my lost games, it could have been closer had I «read» the match correctly and acted accordingly. Did what was expected. Good source of Ld, and surprisingly effective in the magic phase with her 3 spells. The toxic spores were a bit of a letdown, although I didn’t really face any big gribblies that they could have targeted. A choice that’s neither here nor there, and a source of endless mockery by my teammates during the entire weekend. He may look good on paper, but the truth is that he dies to a stiff breeze, and costs an arm and a leg VP-wise. I’d play a shapeshifter again, although I’d definitely equip him with the dragon helm instead. But giving him the Battle Standard is a no-go; after a couple of fiascos, he spent his battles doing practically nothing of importance. They rarely died, and kept my general alive most of the time. The new skirmish rules make it difficult for a skirmishing unit to have an impact in close combat, both because of their footprint (difficult to get into a flank) and because of the lower number of attacks for the same frontage. Their ability to act as a skirmish screen against shooty armies and the fact that they are steadfast in forests is what makes them a relatively good choice. I cannot say I am a fan of the small units, they die too easily for my liking whereas a bigger one conserves points better. 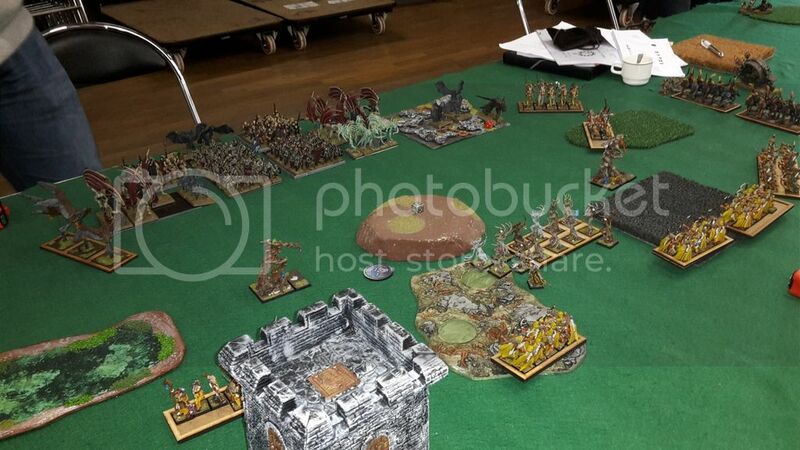 However, they did give me the win in the first game (had we played the full 6 turns they’d have annihilated the Pestilence block), and played a pivotal role in the fourth game against Sylvan Elves. Too small to play the scoring role, at least for me. I don’t care what the internet says, these guys are still great despite the skirmish nerf. The combination of vanguard, the -1 to be hit and their respectable damage potential makes the enemy wary of them. A pity that my lack of real redirectors forced me to use them as such in a couple of games. I’ve never played a game without them since 6th edition: there are times when you’ll lose them to the first volley of the game, and others when their charge will win you a game. All in all, they are worth having for the psychological impact on the enemy. Oh, and against armies without ranged threats, they really shine. I had forgotten how durable treefathers can be. Ws5, 3+/5++ save and T6 makes them probably the toughest monster around, and their Root attack compliments a fast moving force quite well (at least, you have the feeling that they’re useful while maneuvering into position). With deployment zones being closer nowadays (in 3 out of 4 scenarios), their movement 5 is less of an issue as long as they are deployed correctly. The ultimate anti-shooting tool in my opinion: there is something very fun about hitting a skirmishing opponent inside hard cover, at long range, after having moved, on a 2+. While I understand the sentiment of players that would like them to be machineguns, I kind of enjoyed having a finer tool: their scout ability means that they always get the first volley against the enemy, while from experience there will always be a good target for them, even with S3 arrows. The lack of magic missiles makes them quite durable, since enemy shooting has a hard time killing them. Overall, I enjoyed having them around. Their cost is high, but with careful use they should survive to tell the tale more often than not. List assessment: if I had to do it again, I would definitely try to do the following. Give the BSB to a more reliable character. Bring 2 more levels of magic, for example some Briar Maidens or even a Ring of Fire. Bring a second unit of Kestrels, and perhaps an Eagle. It has better ranged potential, slightly more punch in magic, and better maneuverability with less wild cards (Wild Huntsmen, Shapeshifter). And with that, this battle report series has come to an end! Over the next few months I’ll try to hit a couple of local tournaments, perhaps even the Team event in Herford in April. As always, month-late reports with blurry photos and totally fabricated stories (#alternative facts) are to be expected. So take care, feel free to leave a comment and see you at the gaming tables! Pictures are gone with the wind.. can you repost them? Thanks! This is photobucket's doing, they changed their rules. I'll try to upload the pics to the gallery, but it might have to wait for a bit..
Hope to see you in the next tour d'ebene tournament!